Wield the Blue Repeller Sword at your next cosplay event and watch heads turn! This massive 34" stainless steel blade features a unique shape and oversized bejeweled guard that makes it immediately a show-stopper in the anime world. The aqua blue and silver two-tone finish adds to its beauty. This anime sword comes to you with a black leather scabbard and measures 44" from end to end. 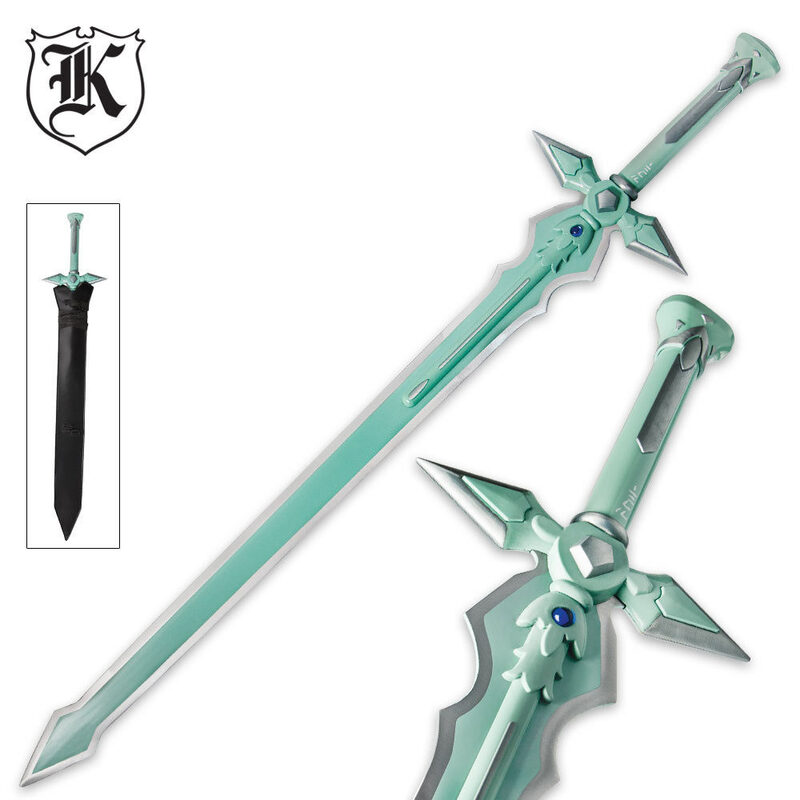 It has amazing detail, notging wrong with it what so ever, it goes alone well with the Elucidator i also have, and they are just wonderful swords, i would recommend this sword to any sword art online fan and this site to any sword lover! It came in just 4 days! And that was with normal shipping, totally worth the wait. i don't understand what it says on the handel, but i dont need to to know how amazing it it. If you are reading this and dont have it, go get it! A beautiful piece and for a low price, my slight issues were the globes of grease around the guard and the one of the horns on the guard was bent flat on one side, though sanding would make it more bearable. Looking forward to many more purchases with TrueSwords. Got this for Christmas and was ecstatic. Nice and heavy, just like the show describes. Well painted. Looks amazing. Curious what the tang is made up of for nerd reasons but all in all, this sword is near perfect. I bought this and it is decent, the pommel is loose and there is wood glue on the handle so I have to give this 4 starts, also the blade is very heavy (and not sharpened) but that is OK, worth $30! I bought this sword not knowing what to expect from it. It is a very nice piece in my room and looks fantastic. It has a heavy weight to it which makes sense due to the Anime. The detailing looks great and the paint on the handle is just superb. The scabbard is the only slight downside but the sword is an absolutely great quality and u can't wait to get the Elucidator next. A must buy for any Sword Art Online fan. 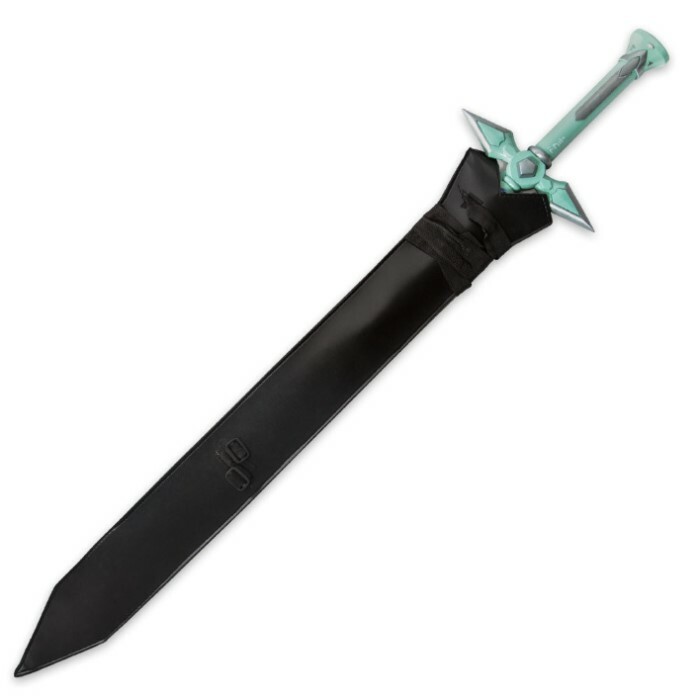 This sword is a great buy for anyone who likes SAO. I love it and it is sturdier than I thought it would be. It doesn't come sharp, but it just for decoration. It is also heavy like Kirito said and that is pretty cool. It does have a little bit of machine oil on it, but that isn't problem. I've been a long time buyer of swords from True Swords. So when I saw my 2 coveted SAO swords were on the website, it was an instabuy for me. For The Dark Repulser, it's heavier than my previous 3 purchases. I didn't think it would be this heavy, but I love the weight to it. The detail is out of this world, I couldn't ask for a better representation of it. The ONLY problem I have with this sword and it's probably just the one I was sent is that on one of the sides, the paint looks like it didn't dry properly and there's a small spot where it's chipped off. I might ask for an exchange. If it wasn't for that, I'd give this a perfect 5/5. This sword is very well made. It is sturdy, however the hilt was not connected to the blade as well as it could be. It isn't sharp... at all. The sword has INCREDIBLE weight to it. It came with a layer of oil on it but that came off quickly. All in all a great buy for a great price. Only down side hilt not glued on perfectly but just reglue its fine! Such a Great Wall hanger an it's solid an heavy! This sword is great for the Sao lovers!